Hone your skills against this most unique and peculiar landscape, dotted in every direction with ruins of temple complexes and giant boulders that took shape over millions of years - a breathtaking setting that is sure to inspire amateur and seasoned rock-climbers alike! 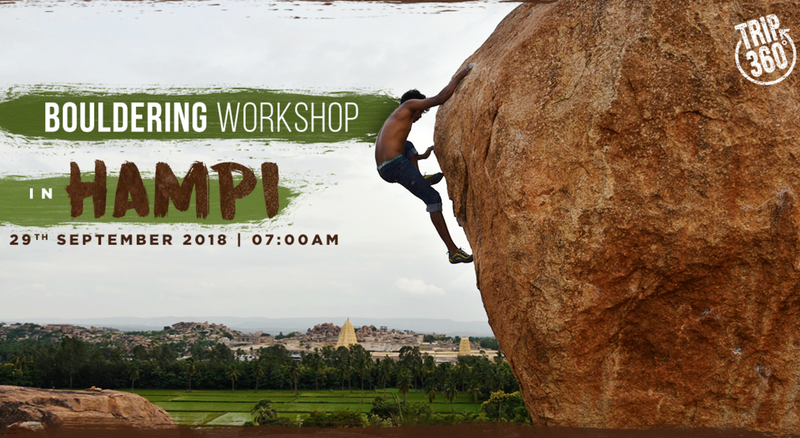 Trip 360’s Bouldering Workshop in Hampi, is designed to cater to your adventurous spirit and gives you a nudge in the right direction towards the sport of rock-climbing. From introductory sessions on bouldering, slack-lining and top-roping equipment to rock-climbing workshops and more, the 2 day event is sure to get your adrenaline pumping. You can also make the most of your time by exploring the caves, cycling through the culturally rich town and climbing atop Matanga or Hamakuta Hill to witness a glorious sunset. Nature walk along with cave exploration. Any additional activities or sightseeing. Drinking or smoking is not allowed in the bungalow premises. You are expected to carry your own yoga mats for hygiene purposes. Stay will be on sharing basis. Single room supplement will be charged extra. We require a minimum of 06 participants to conduct this retreat. We reserve the right to cancel the departure if minimum group strength is not met. In such case, full refund of the paid amount will be initiated. A minimum of 6 Participants are required to conduct this trip. If the minimum group strength is not met, we have the right to cancel the event and initiate full refund of the amount paid.